This is a non-commerical web-site to showcase the cycling achievements of Chris Newton from Stockton-on-Tees in the North-East of England. Please note that nearly all photos and race articles presented on this site have been sourced from various magazines and web sites - most notably with thanks to Snowdon Sports, Cycling Weekly, CyclingNews and the British Cycling web site (special note of thanks to webmaster Larry Hickmott). Chris Newton was one of the United Kingdom's best ever international riders both on the road and track. 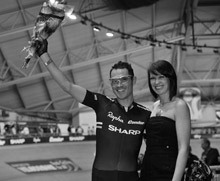 The former World Track Champion in the Points Race and in the Team Pursuit, Chris was the first ever British and English speaking (first language) rider to win the points title, a remarkable achievement. An integral member of the very successful British Olympic squad he took a Silver medal at the Athens Olympics, a Bronze medal at Sydney and more recently a Bronze medal in Beijing. This year also saw him take several medals at the World Cup culminating in the World Cup 2008 Series title. 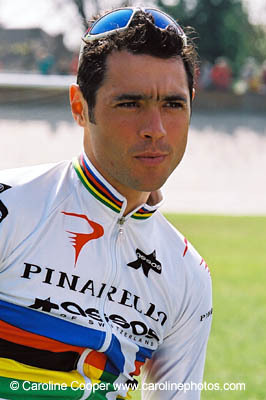 Although Chris has never joined a major continental team he has frequently beaten some of the world's top professional riders whilst racing for the Great Britain team, including two victories in the Irish Ras stage race (2003 and 2005) and the prestigious "Circuit des Mines" stage race in 2001. Whilst winning this established French stage race he beat some of the best young and more experienced professional riders on the European scene and in very convincing fashion, leaving no doubt of his special talent. Add to that many other overall and stage victories in International events and the winner of most of Great Britain's biggest races on the road and track. 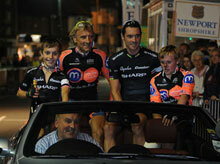 Chris has also been National Champion in most of the major cycle racing disciplines, i.e. Road, Time Trials and Track and recently started riding in the highly competitive SIX DAY circuit. This gives you some idea of his top class all round abilities. Chris Newton's reputation as one the UK's finest racing cyclists has of course been reinforced by his two World titles & 3 Olympic medals and his position as one of the highest profile riders in British Cycling is without question. Chris has now retired from professional cycling and will be joining the coaching staff at the Great Britain Cycling Team, taking on the role of Olympic Academy Men’s Endurance Coach.